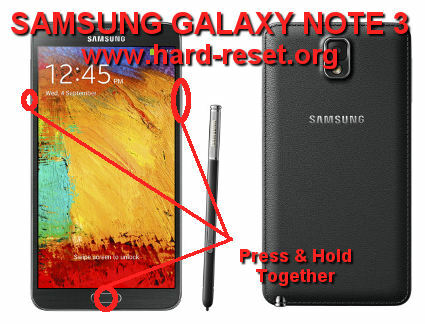 How to Easily Master Format SAMSUNG GALAXY NOTE 3 GT-N9000 / N9002 / N9005 with Safety Hard Reset? Tips and trick for solve problem at SAMSUNG GALAXY NOTE 3 GT-N9000 / N9002 / N9005. The product of SAMSUNG GALAXY NOTE III have other different identity with code name. The type code are GT-N9000, GT-N9002, GT-N9005, but the main specification is not different, only the radio data different. We will get very sharp and colorful images color at SAMSUNG GALAXY NOTE 3 because it have fantastic Super AMOLED technology at bigger LCD screen 5.7 inches, very impressive for anyone who use this smartphone. SAMSUNG GALAXY NOTE 3 GT-N9000 / N9002 / N9005 also have fast processor speed at 2.3Ghz Quad Core include bigger RAM 3GB, like no others today, but maybe next time more smartphone will have bigger RAM than SAMSUNG GALAXY NOTE 3. What is Advantage of SAMSUNG GALAXY NOTE 3 GT-N9000 / N9002 / N9005 Specifications? How to Fix and Problem Solving for Recovery SAMSUNG GALAXY NOTE 3 GT-N9000 / N9002 / N9005 hang or not responding or malfunctions or stuck or freezing or bricked ? Every user who see the specifications of SAMSUNG GALAXY NOTE 3 GT-N9000 / N9002 / N9005 will agree that the fantastic processor speed and big memory RAM will make this smartphone run very impressive without problem for almost all applications which download from Google Play Store. Some applications can also install manually using APK type, but some of them sometime not always safe or maybe not compatible with SAMSUNG GALAXY NOTE 3 GT-N9000 / N9002 / N9005. The problem from applications could make the phone become hang or stuck or bricks or frozen or LCD touch screen become not responsive or can not do anything. We need to try doing soft reset or restart or reboot to delete some applications cache and temporary files. If the phone still get the same problem after doing soft reset, then we have to do hard reset or master format SAMSUNG GALAXY NOTE 3 GT-N9000 / N9002 / N9005. How to Soft Reset or Reboot or Restart SAMSUNG GALAXY NOTE 3 GT-N9000 / N9002 / N9005 ? If we need to do soft reset or reboot, the faster way when the phone get hang or stuck is remove the battery from the phone, and plug it again in the positions. Turn SAMSUNG GALAXY NOTE 3 GT-N9000 / N9002 / N9005 on will make the phone finish doing soft reset. We also can press and hold the POWER BUTTON until LCD appear menu to restart or turning off. Choose Reboot or Restart then the SAMSUNG GALAXY NOTE 3 GT-N9000 / N9002 / N9005 will doing the soft reset. This is safe because the process will not erase or wipe any important data. The SAMSUNG GALAXY NOTE 3 GT-N9000 / N9002 / N9005 will doing the factory data reset. Press Power Key to select or enter. Please be careful, because all data will removed from SAMSUNG GALAXY NOTE 3 GT-N9000 / N9002 / N9005 when access that code. How to Restore and Reinstall Clean Android Operating system / firmware at SAMSUNG GALAXY NOTE 3 GT-N9000 / N9002 / N9005 ? Using SAMSUNG GALAXY NOTE 3 GT-N9000 / N9002 / N9005 will make us happy to install more applications and some user will setup special option to make this smartphone run more fun. But doing this step sometime will make the phone become running with problem, and at this time we need to do reinstall or restore the clean and factory default setting Android operating system or firmware. We have to know that the clean and factory default Android operating system already saved inside SAMSUNG GALAXY NOTE 3 GT-N9000 / N9002 / N9005 ROM, so we do not need to connect anything while we need to reinstall or restore the factory default Android operating system or firmware. Just do the step for hard reset or master format, then the clean Android operating system or firmware will be reinstall or restore automatically to SAMSUNG GALAXY NOTE 3 GT-N9000 / N9002 / N9005. Please becareful to do this, because all important data or installed applications will be deleted or wipe from this phone. How to Unlock or Fix or Bypass or Solutions for SAMSUNG GALAXY NOTE 3 GT-N9000 / N9002 / N9005 forgot password code or security lock screen pattern or pin (lost password)? When we have important data or images or videos on our SAMSUNG GALAXY NOTE 3 GT-N9000 / N9002 / N9005, maybe we need to give security protection to make the phone more secure while away from us. The screen lock screen protection is recommended to use because for us this protection is easy and fast to open when we need to use this phone. But some other options for screen protection also available to choose. What about if we forgot the answer of security protection password pin or screen lock pattern? Do not worry because Android have solutions for this problem. We can bypass or unlock forgotten password protections at SAMSUNG GALAXY NOTE 3 GT-N9000 / N9002 / N9005 with find Forget Password / Pattern button. When this button is not available, please try to un-hide it by try to give several wrong password answer continuously, usually after several time the phone will locked and the help button (Forget Password / Pattern) will be appear. Press this button will bring us unlock the security protection by answer the Google account username and password. If we can not access Google / Gmail account at this phone, then we need to do hard reset or master format. How to Improve Performance SAMSUNG GALAXY NOTE 3 GT-N9000 / N9002 / N9005 to make run more faster? SAMSUNG GALAXY NOTE 3 GT-N9000 / N9002 / N9005 already very fast to run almost all applications from Google Play Store, with Quad Core or double Quad Core processor will make this smartphone run any applications without problem. But some user still get problem with SAMSUNG GALAXY NOTE 3 GT-N9000 / N9002 / N9005 which act strange and the speed become slowly. Some problem happen because there are too many applications installed and run together in the background without any notice. Although SAMSUNG GALAXY NOTE 3 GT-N9000 / N9002 / N9005 have very big RAM as 3GB RAM, this RAM is not unlimited. There is always some limitations for how many applications which recommended to run together in the background. That is why we can try to make it faster by reduce run or installed applications. If we need to make SAMSUNG GALAXY NOTE 3 GT-N9000 / N9002 / N9005 performance back to faster again like new, then we may consider to do hard reset or master format. Is That Any Secret Code for Doing Format SAMSUNG GALAXY NOTE 3 GT-N9000 / N9002 / N9005? The secret code for doing hard reset SAMSUNG GALAXY NOTE 3 GT-N9000 / N9002 / N9005 is *2767*3855#. But please remember to always be careful typing that code, because the SAMSUNG GALAXY NOTE 3 GT-N9000 / N9002 / N9005 will doing hard reset and remove all data and installed applications. [A] Hi, please try to follow steps at #option 2 to reformat your Samsung Galaxy Not 3 operating system to factory default using hardware button combination key. [A] Hi, you should use the right firmware version for your Samsung Galaxy Note 3. Please try to reflash with correct version at Samsung authorized service center. How to Easily Recovery SAMSUNG ACCOUNT Lost / Forget Password ? How to Easily Master Format VIVO X9 with Safety Hard Reset? How to Easily Master Format ONEPLUS 2 (TWO) with Safety Hard Reset? Hi, if your Samsung Galaxy Note 3 always get hang when charger connected, it seems that an application try to run something (notification or something like that) but can not run properly. This problem can make our phone hang. So please try to uninstall all battery 3th party tools applications. If the problem still exist, then you need to try perform hard reset. Hi, usually if your Samsung Galaxy Note 3 can not detected by KIES applications, then you should make sure that the Driver already installed correctly. If you can not make sure about this problem, try to use other computer with Windows operating system, first you need to connect the PC to Internet, after that please try to connect between computer and Samsung Galaxy Note 3 using USB data cable. If the PC can not find the driver, then the PC will use Internet to download the driver. We recommended to use PC with Windows 7 operating system, but you can try with other Microsoft operating system at your PC. Hi, by default the network setting of Samsung Galaxy Note 3 can be access from Menu Setting > Connection > More Network > Mobile Network. You can see weather the network active or not, also check the Data enabled (or data is active). If you can not access that menu, then some trouble happen with your operating system, then you should try to do hard reset for make it back again. But please backup all data first because hard reset will delete all important data. Hi, sorry reply in English, if your Samsung Galaxy Note 3 have trouble and can not use properly, then you have to force hard reset using hardware button combination key like steps at #Option 2 above. Hi, if we do master format or hard reset, then all account will be remove from your Samsung Galaxy Note 3, include installed applications. The operating system and applications will be restore back to factory default. But your Samsung account is note remove from Samsung server, this is similar with Gmail account. As far as you remember username and password, then you need to login again that account at your Samsung Galaxy Note 3 then you can use that account again. Yes you can create new Samsung account when the first time setup your phone. im update my fone from 4.3 to 5.0 using odin..
Hi, you should use the right firmware version for your Samsung Galaxy Note 3. Please try to reflash with correct version at Samsung authorized service center. Unfortunately, tha process com.android.systemui has …. Hi, please try to follow steps at #option 2 to reformat your Samsung Galaxy Not 3 operating system to factory default using hardware button combination key.